The previous chargers from Anker could support up to 10W of charging on Android devices, but the iPhone was still limited to 5W. When the iPhone 8/8 Plus/X launched, they only supported 5W of power using Qi. It wasn't until iOS 11.2 was released that the latest iPhones could take advantage of up to 7.5W of power. The new devices, which were first previewed at CES in January, come in a new white finish. Both the new charging pad, and the charging stand come with a white micro USB cable and a power brick. The micro USB cable feels like a well made cable, and since Anker makes their own already, it is clearly one of their own branded cables. For me, it is much to short to actually be used. It simply doesn't reach around my desk, or to my unusually-high nightstand. Luckily, of all the parts, the USB cable is most easily replaced. Most people will have their own anyway, and Anker sells them in larger lengths. The included power brick is a nice QuickCharge 3.0 wall adapter, which is capable of fast charging certain Android handsets. The prongs collapse, making it easier to store or travel with if needed. Anker usually sells these by themselves for around $15. If you've looked at a lot of different wireless chargers, you may notice many don't include power adapters. The fact Anker has included one is a big differentiator, and partially justifies the price tags. Between the two, the charging pad got the most overhaul from the original wireless chargers from Anker. It has a new built-in fan which is nearly silent. It helps keep the charger cool, as well as to prevent slowdowns from high heat. The top has a nice soft-touch finish which not only feels good but prevents your phone from sliding around the top. The bottom has a silicone ring subset within an array of vents. The vents are there for the new built-in fan. The higher charging speeds can often cause chargers to overheat, which causes them to slow down. The nearly silent fan helps alleviate this worry, but does cause the charger to be a bit larger than the PowerPort 5 Wireless Charger they released in the past. The charging stand is my favorite between the two, though it is largely unchanged from the original, minus the new color. The charging stand takes up considerably less real estate on your desk and makes it easier to view notifications when they come in. And, if you have an iPhone X, even better, Because the phone is face up, it is able to be unlocked through Face ID without the necessity of you having to pick up the phone or lean over awkwardly. What I can clearly say about the Anker wireless chargers is that they are efficient. They do what they do, and they do it well. There is no flash, no surplus features. Anker is known for having understated designed with a utilitarian mindset. You can pick up either of the two wireless chargers now, directly from Amazon. The charging pad is the cheaper of the two, running $45.99. The PowerWave 7.5 Charging Stand has a slight premium at $49.99. At the moment, Anker is running a 15 percent off promotion to celebrate the launch, but it won't be around for long. If neither of these are your style, be sure to check out our previous wireless charging roundup for more ideas. It used to be AI, like Apple, said not to use third party chargers because they weren’t reliable (and burned up). Have things changed to the point where we can trust them over Apple chargers? Things are a little different with Qi than they are with a straight USB connection with no protection from the mains if something goes horribly wrong. I'm still not sure you want to use a "Joe's Qi" charger from the gas station. We still don't recommend generic AC-DC adapters. Can a longer cable be purchased with out an adverse effect occurring, as in slowing down the charging speed? Is that a watch charging box on the left or post it notes? Does it charge the watch 0,1,2,3 as well? Does this work for the Watch as well? Anker is a well known brand with a great reputation for quality and service. I’d get Anker over Apple any day. Apple chargers, for me, have always crapped out way too quickly. All my Anker stuff is still going strong. Will the phone charge on the charging stand if it is set on it sideways? There are a bunch of clock apps (I use Clocks) that display the time in larger characters when oriented sideways. I plug my iPhone in every night, and I prop it up on a stand sideways to make it my bedside clock. PS: I'm actually a little surprised that the Apple Clock app doesn't have a desk/bedside clock mode. 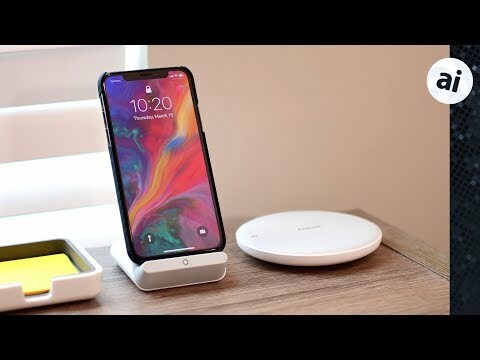 Edit: I just followed the link in the article to the wireless charging roundup and found that there are several stand type chargers that are reportedly able to charge when the phone is sideways. I presume the fastest way to charge any iPhone, wireless or not, is to use an iPad AC adaptor. Is that correct? The video here was nicely done, but ... really not necessary. The pictures to,d the tale, and it was faster to just read the article. That's the case with just about every such video ever made. I almost never watch posted news videos - I'd much rather scan the text which takes far less time. That is not correct, using an Apple 29W USB-C Power Adapter would be a quicker method. There are other venues, say YouTube, than AI's homepage. Ahh. Forgot about that. Thanks. I've been using the 29W USB-C charger that came with my 13" MacBook since I got my X and I have a hard time justifying going to wireless charging that is slower than using the 29W charging. The convenience of laying my phone down on a charging pad vs. plugging in a cable just doesn't outweigh the faster charging times I get with the 29W adapter. If I ever get an 8 or X, I'd be tempted to grab a charging pad or two, but they wouldn't be my primary means of charging, at the moment. A recent znet article states that when charging wirelessly, the iPhones' batteries are also powering the phone. When charging via cable, the bulk of juice comes from the cable, not the battery, so less strain on the phones battery, and importantly, fewer life cycles used. So while I really like convenience, I'd probably only have a charging pad in areas where I set the phone down for a short time, unless I need faster or longer charging.